1. 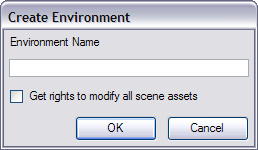 In the top menu, select Environment > Create or you can also right-click in the Environments section and select Create. In mixed platform Environments (Linux and Windows or Mac OS X and Windows) it is best to name everything in lower case so that data can be interpreted the same on each operating system. The same is true if working between studios using Windows, Linux and Mac OS X. 2. Type the new project's name in the Environment Name field. The environment name is alphanumeric and can include underscores (_), but no spaces or other special characters. The environment name is case sensitive. 3. 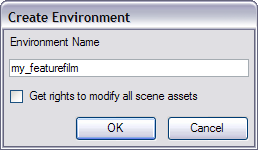 If you want the user to automatically get the rights to modify all the scene assets (drawing, scene setup, palette lists, etc. 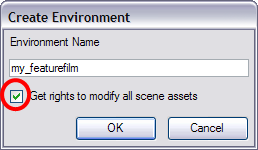 ), enable the Get Rights to Modify All Scene Assets option. 4. Click on the OK button to complete the operation. After you create an environment, you must add it to the Batch Processing queue so that it can vectorize and render the drawings and scenes automatically. You only have to add the environment to the Batch Processing queue once.